With the inclusion of contemporary machines and advanced tools in all our processes, we have been able to offer a distinguished assortment of High Pressure Hydraulic Cylinder. The offered range of hydraulic cylinder is intricately manufactured using premium grade raw material and cutting-edge technologies in complete compliance with universally accepted norms of quality. In addition to this, the offered gamut of cylinder is available in various sizes and specifications with respect to meet the variegated requirement of our clients. 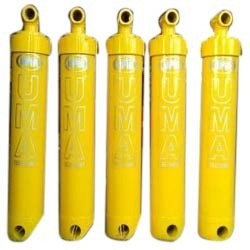 Established in the year 1981, we, “UMA Enterprise”, are recognized as the leading manufacturer and supplier of Hydraulic Jack, Hydraulic Jack Accessories, Hydraulic Cylinder, Pressure Hydraulic Cylinder etc. The raw material we use to produce these items is sourced from reliable vendors of the market in compliance with international quality standards. As per the ever changing requirements of our clients, we offer these products in various specifications. Further, clients can get these products as per their precise needs through our customization facility. Offered products are widely demanded all across the globe due to their high performance, sturdy construction, energy efficiency, less maintenance, corrosion resistance and long service life. We have created a significant place in the national as well as international market by consistently maintaining the quality of our products.